1. 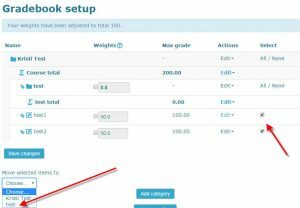 First, go to the gradebook by clicking the Gradebook setup link in the Course Administration block. 2. At the bottom of the page, click the Add category button. 3. Give the category a name. Remember the aggregation method is Natural. 4. When finished, click the Save changes button at the bottom of the page to return to the categories and items page. * We’ll set weights on the main Gradebook setup page. 2. At the bottom of the page, click the Add grade item button. 3. Give the item a name and fill out the other fields as desired. You can use the “Grade category” drop-down menu to select the category you would like the item to be graded in. 1. On the gradebook setup page, select the items that you would like to move into a category by checking the box in the far right column for the item. 2. At the bottom of the page, use the “Move selected items to” drop-down menu to select the destination category and the item will relocate to the selected category. To add an item as Extra Credit, click on the “Edit” drop-down arrow to to right of the assignment. Choose Edit Settings. Below the Weight information, check the Extra Credit check box and click Save Changes.